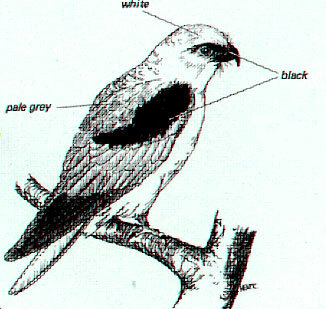 This nomadic species is a fairly common bird of prey which occurs singly or in pairs. Kites are hovering hawks. Like the Kestrel it hovers over its prey and then drops suddenly to the ground. It can often be seen in the Park sitting motionless, either on a wire or post. It’s diet includes Mice, Lizards and Grasshoppers. The open nest of twigs is often built in a eucalypt tree forty to eighty feet from the ground. Occasionally it nests in a hollow tree or even in a disused nest of another bird. The four or five off-white to buff coloured eggs are laid on a bed of leaves within the nest. The eggs are over marked with irregular shaped markings of rich umber brown to dark umber black. Nesting season is winter to spring.